Like the free version of our plugin? Donate! Once the initial bugs are worked out for the new version, we’ll be working on the Pro version with lots of goodies! What if I don’t want to pay for the Pro version? That’s easy, just don’t! The plugin will still be free and have most of the features it has now, plus, additional features to be released with the premium version of the plugin. There are many sites that are crawling for user-generated reviews now, including Google Places and Google Local Search. 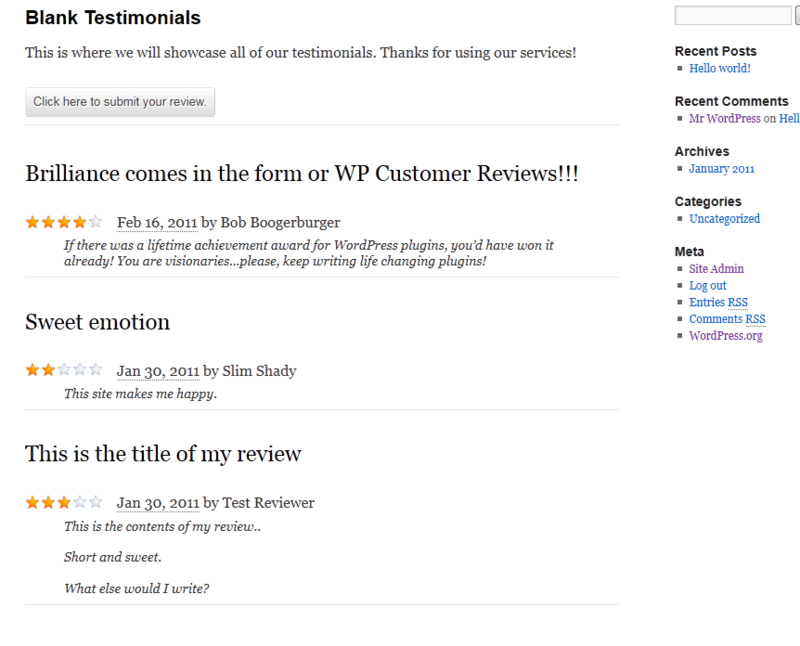 WP Customer Reviews allows you to setup a specific page on your blog to receive customer testimonials. All submissions are moderated, which means that YOU choose which reviews get shown. Multiple anti-spam measures to prevent automated spambots from submitting reviews. Provides a configurable Business hCard, to help identify all pages of your site as belonging to your business. Works with caching plugins and all themes. Includes an external stylesheet so you can modify it to better fit your theme. Reviews can be edited by admin for content and date. Support for adding your own custom fields with one click. The plugin can be used on more than one page. Supports both Business and Product hReview types. Shows aggregate reviews microformat (hReview-aggregate). Fast and lightweight, even including the star rating image. This plugin will not slow down your blog. Validates as valid XHTML 1.1 (W3C) and valid Microformats (Rich Snippets Testing Tool). Upload contents of compressed file (wp-customer-reviews) to the `/wp-content/plugins/` directory. Activate the plugin through the `Plugins` menu in WordPress admin. 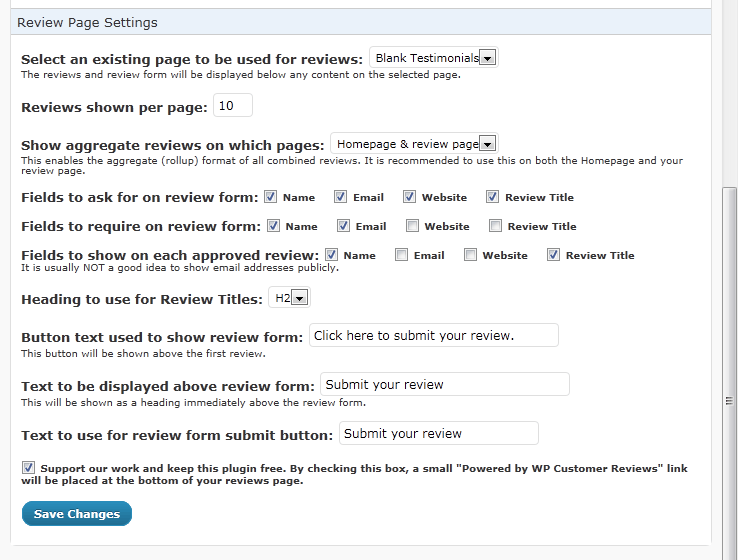 Create a WordPress page to be used specifically for gathering reviews or testimonials. 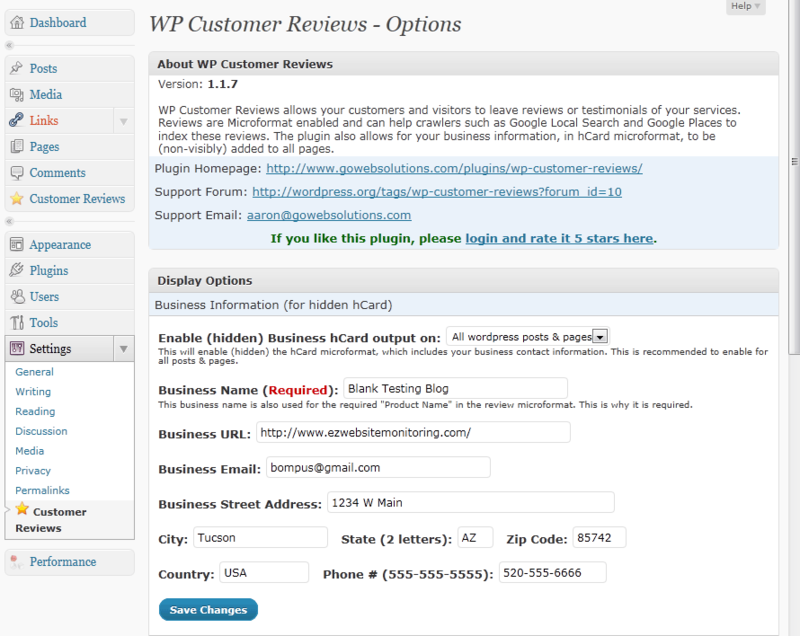 Go into settings for WP Customer Reviews and configure the plugin. 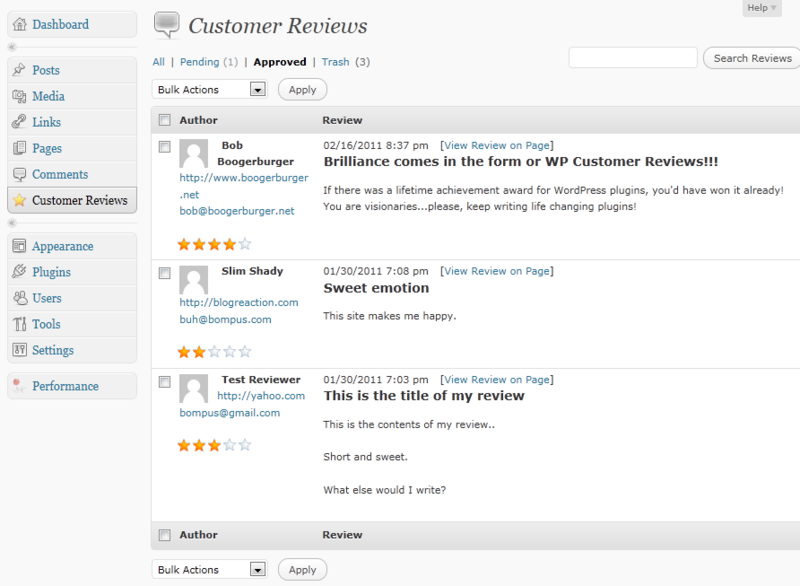 Free support is available via ONLY the WP Customer Reviews support forum. Due to the overwhelming response, we are not able to provide individual customizations for this plugin. We have future plans of updating including average star ratings and avatars, but no release date is currently available. We understand that each user might have a specific feature in mind that would work for their website. We have created the plugin that would work well for the general audience. Before leaving negative comments, please keep in mind that we spent our time, money and resources creating this plugin and offering it to everyone for free. Want to suggest a New Feature? Submit your suggestion on our UserVoice page. We work very diligently on this plugin. If you find this plugin useful, and wish to donate toward the future development of this plugin, you may do so here. We use EffortlessHR – Online Human Resources Software.